Western bean cutworm continues to expand its range throughout the eastern Great Lakes region and has now been found as far northeast as south-central Quebec. 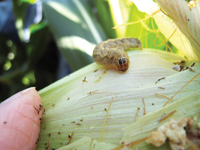 This is a concern for corn and dry bean growers because larval feeding can cause serious damage in these crops. Although economic damage has not yet occurred in Ontario, growers are wondering what to expect in 2010 and beyond. Damaged cobs and kernels are evidence that western bean cutworm has left the plant to overwinter in the soil. Photo courtesy of Mervyn Erb. To get a handle on what could happen as the insect moves east, entomologists and extension personnel in the eastern Great Lakes region are communicating and comparing insect numbers and control measures. In Ontario, the moth mainly appears to be coming across Lake Huron from Michigan, rather than north from Ohio, where numbers are still low, says Tracey Baute, entomologist with the Ontario Ministry of Agriculture, Food, and Rural Affairs (OMAFRA). Baute is watching the moth’s progression in Michigan as a model for what might happen in Ontario. 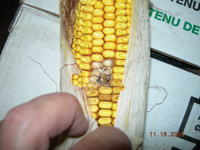 Western bean cutworm was found in Michigan in 2006 and in Ontario in 2008. The larvae consume the fruit of dry edible beans (Phaseolus vulgaris varieties) and corn, and can cause direct yield loss, grain quality issues, and exposure to secondary pests such as moulds. In western Michigan, nine counties experienced some form of economic loss from the insect in 2009. However, feeding damage reported in eastern Michigan and Ontario was still at low levels. 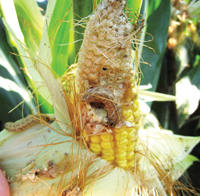 Western bean cutworm can be particularly damaging because multiple individuals can infest a single corn ear. Photo courtesy of Tracey Baute, OMAFRA. For laying eggs, the adult moths tend to prefer corn until the crop is tasselling, says Baute. Once the crop is tasselling, moths will look for younger cornfields or dry-bean fields to lay eggs. To determine the presence and numbers of adult moths, which emerge in mid-June to early July, they are trapped using simple pheromone traps placed at the crop’s perimeter. Two traps are recommended at bean fields. Moth numbers are counted, and control measures are implemented once a threshold number of moths has been trapped. Based on the observations of Michigan State University entomologist Chris DiFonzo, says Baute, the economic threshold for dry beans that was developed in Nebraska does not seem to be working in Michigan. “It didn’t protect the crop in time, and there was still yield loss.” The researchers speculate that more eggs and larvae are able to survive to inflict damage because of the greater humidity in the Great Lakes region than in Nebraska. “For now, control thresholds are a bit of guesswork in the dry bean crop,” says Baute. However, the entomologists are working to determine appropriate thresholds for the Great Lakes region. In contrast to bean fields, traps at cornfields are used to determine when the moths arrive and when their numbers peak, indicating when the most eggs are being laid. “If we see peak moth flight, that tells you that you should be out there scouting for eggs and trying to control the larvae,” says Baute, noting that a single trap at the cornfield perimeter is recommended. “I find it difficult to predict if you’ll see damage in corn based on the trapping numbers,” says Dr. Andy Michel, Ohio State University entomologist. “I’ve looked at some of the data that Tracey Baute has put together across the whole eastern Great Lakes. In Michigan and Ontario, trap counts can be as low as two, and minor (noneconomic) damage can be detected, whereas in some Ohio counties, I have almost 100 moths and haven’t been able to find damage.” So crop scouting is necessary to determine western bean cutworm pressure. Once the moths are found in the traps, it is time to start scouting for eggs and larvae to determine if control is necessary. The timing of insecticide application is extremely important, as only the exposed larvae will be affected. Those that have not yet hatched and those that have already entered the corn ear or bean pod will not be killed. “That leaves a small window when spraying must be targeted in order to be effective against western bean cutworm,” says Michel. Scouting differs for corn and dry beans because of differences in insect behaviour. In corn, the moths lay eggs on the upper surfaces of the upper leaves. “If five percent of plants scouted across the field have egg masses on them, then you spray when they’re about to hatch,” says Baute (see www.omafra.gov.on.ca/english/crops/field/news/croppest/2009/12cpo09a6.htm for details on scouting methods in corn). However, in dry beans, the moths lay eggs low in the canopy on the underside of leaves, and larvae usually spend the daytime in the soil, rather than on the plant. “They’re very hard to find, and even damage is sometimes hard to find,” says Baute. So growers must rely considerably on moth trap thresholds for dry beans. Mervyn Erb, an independent crop consultant from Brucefield in Ontario’s Huron County, has scouted for western bean cutworm in both corn and dry beans. He saw some feeding damage in corn in Chiselhurst, near Hensall, in 2008 and north of Exeter in 2009, both in Huron County, as well as in kidney beans west of Innerkip in Oxford County, in 2009. “In corn, they had chewed the kernels and burrowed into the cob, and all that was left of the cob in that feeding area was the kernel caps holding themselves together and a big hollow spot underneath,” he describes. “The kidney beans were just pods with holes in them, and all the seeds inside were chewed up.” However, he says the damage was not widespread. Chemical companies are working on a solution to western bean cutworm, and if there is a need in 2010, OMAFRA could sponsor an application for emergency use registration. Scouting for western bean cutworm in corn is not as easy as it sounds because the eggs are on corn leaves that are above head height, says Erb. “You just don’t walk into a field and find them that readily.” It is not easy in beans either. “Beans are usually easy to scout because you can look down on them and see them,” he says, but for western bean cutworm, each leaf must be turned over to look for egg masses. However, Erb thinks that the insect might be less of a problem in dry beans than in corn because growers are already scouting and applying insecticide to control tarnished plant bug and leafhopper. “Normally, we are doing one or two sprays for those two insects in edible beans, so chances are, western bean cutworm is going to show up around the end of July or first week of August, and in that time frame, we’re quite often making a first or second application of insecticide,” he says. He thinks that what will be important is having insecticides with extended residual activity, in hot, dry weather, for dry beans because the eggs will hatch over a period of time. Chemical companies are working towards registering pyrethroid insecticides for dry beans and corn. “I’ve been told by our OMAFRA minor use co-ordinator that he’s quite confident that we will have something for the 2010 season,” says Baute. If registration is not complete by then, OMAFRA could sponsor an application for emergency use registration if necessary. According to OMFRA’s Tracey Baute, the moth’s progression in Michigan is the model for what might happen in Ontario. It is anyone’s guess as to how serious this pest will be in 2010. However, growers who have already had it in their area should be especially vigilant, put up traps, and “expect at least to be scouting next year,” says Baute. This will give growers a level of comfort as to whether management is necessary, allowing them to respond if needed. Because of the high numbers trapped in Huron County, “that area will be more at risk next year for having larvae overwinter, as well as receiving more from Michigan, so we’ll be really monitoring that location,” she says. Erb reports that growers are already showing concern about western bean cutworm and asking if it is as bad as it looks in photographs. “I think it’s a good thing to have some sense of alarm and some sense of urgency, so they can be prepared,” he says. However, both Baute and Michel caution that their respective regions are not at the stage where everyone needs to plant transgenic corn with traits againstwestern bean cutworm (see sidebar). They also note that, unlike traits for rootworm and corn borer control, these hybrids still allow some damage from the pest. Thus, growers who plant them still need to scout both the transgenic and refuge to determine if additional management might be required. Although there are no transgenic options for protection against western bean cutworm in dry beans, there are options in corn. Some of those are available now, and others are in the registration process. These are described in chronological order. 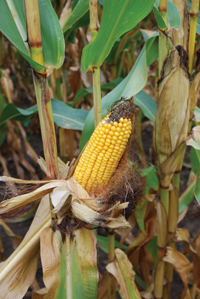 The Herculex trait, co-developed by Dow AgroSciences Mycogen Seeds and Pioneer Hi-Bred, has been commercially available since the early 2000s. This was the first protein from the Bacillus thuringiensis (Bt) bacterium that showed efficacy against multiple lepidopteran corn pests, says Bill Webster, agronomist for Dow AgroSciences Mycogen Seeds. The trait involves the Bt cry1F gene, which produces Cry1F protein. The protein kills lepidopteran pests such as European corn borer, western bean cutworm and black cutworm by disrupting the digestive system. New for 2010 is SmartStax, which was developed under cross-licensing of Dow’s Herculex and Monsanto’s YieldGard traits. SmartStax contains a combination of Monsanto’s technologies and the Herculex cry1F, says Michael Nailor, corn and soybean trait marketing lead for Monsanto Canada. It is the cry1F in this combination that provides protection against western bean cutworm. Stacking traits gives multiple modes of action against the primary pests. This reduces the risk of the insect developing resistance to the trait because the probability of an individual insect developing mutations to overcome two (or more) genes simultaneously is very low. This means that less refuge is required. 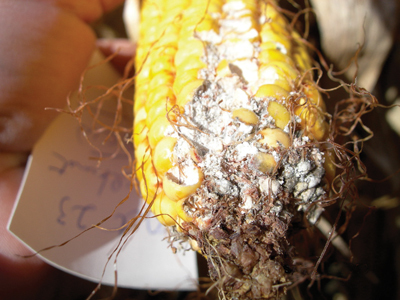 For corn, the primary above- and belowground pests are European corn borer and corn rootworm, respectively. Because SmartStax contains three traits against European corn borer and two against corn rootworm, its refuge requirements have been reduced from 20 percent to five percent. “That’s good for the farmer because they can protect more acres against those primary pests, as well as cover off potential secondary pests like western bean cutworm as it comes into the area,” says Nailor. Monsanto markets SmartStax under the Genuity brand and is forecasting a launch of up to 100,000 acres for 19 hybrids from eight seed brands. Two additional products are currently in the registration process, but are not yet registered for use in Canada. One of these involves stacked traits. The other is a new Bt protein that has efficacy against multiple lepidopteran pests. Pioneer’s AcreMax product concept, which is in the regulatory process, involves stacking its Herculex cry1F and Monsanto’s YieldGard trait to get two modes of action against European corn borer, with the aim of reducing refuge requirements. It also introduces the refuge-in-a-bag concept for above- and belowground insects whereby a certain proportion of seed in each bag would lack the traits for insect protection, says Harwood. The cry1F would provide protection against western bean cutworm. Syngenta has developed a new trait that works against a broad spectrum of lepidopteran pests such as western bean cutworm, black cutworm, fall armyworm, and corn earworm. The Agrisure Viptera trait involves the vip3A gene, which was isolated from Bt found in a carton of sour milk, says David Townsend, crop manager for Syngenta Seeds Canada. The vip3A protein acts similarly to Cry proteins by disrupting the insect’s digestive system. 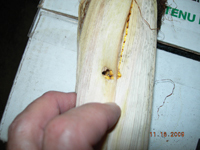 Syngenta is hoping to have materials for sale in 2011, pending registration, and the trait will only be available stacked with a corn borer trait, says Townsend. An April 2009 cross-licensing agreement with Dow gives the two companies reciprocal access to the Herculex and Viptera traits.